The European Patients’ Forum highlights the impact of its one-year campaign focusing on patient empowerment initiatives. 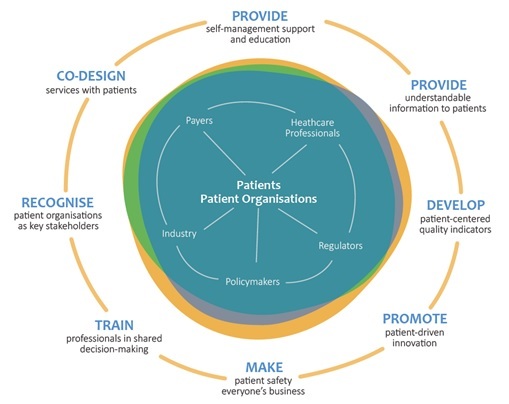 In 2015, following a decision taken by its members to put patient empowerment as a key priority, the European Patients’ Forum (EPF) launched a one-year Patient Empowerment Campaign, building on the previous year’s Manifesto for the European Parliament elections: ‘Empowered patients are an asset to society’. The campaign aimed to build momentum for the real empowerment of patients in Europe and to promote the development and implementation of policies, strategies, healthcare and social services that enable patients to be involved in decisions about, and management of, their conditions. The tagline of the EPF campaign was ‘Patients prescribe E5 for sustainable health systems’, with the ‘E’ standing for Empowerment and divided into five topics (Figure 1). It shows that patients are active people who can, if supported, make a positive difference to the sustainability of healthcare systems. The Patient Empowerment Campaign kicked off with a conference in May 2015 to explore the concept of empowerment, including existing good practices, challenges and pitfalls from the different perspectives of stakeholders. From there, armed with many powerful and insightful contributions, all that was needed was more coherence and political commitment at all levels to really make it work for everybody. After the conference, patient organisations and other stakeholders embraced the campaign and spread the message via 32 events in 11 countries. EPF and other supporters also raised awareness about patient empowerment with publications in different media, gaining mentions in 35 articles/publications in national and European media. In terms of dissemination, online activities were crucial to keep the community posted and engaged. Through different tools and platforms, the campaign reached a significant number of people across the EU who showed their commitment by signing the pledge, using the hashtag or sharing the leaflets (Figure 2). On a more political level, another strategy was to approach policy makers, particularly Members of the European Parliament. A delegation from EPF (accompanied by a real patient) met 12 MEPs individually, from different countries and parties, to present the concept of patient empowerment, publicise the campaign, and ask for support in including the concept in the future shaping of EU health policy. The majority fully embraced EPF’s advocacy work. The meetings also helped to increase visibility and create stronger links. After a year of advocating, EPF held a high-level roundtable entitled ‘Making Empowerment a Reality: Patients as Partners’ to share the results of the campaign and discuss next steps with health professionals, policy makers and patients. This took place on 22 June 2016 at the European Parliament in Brussels, and was co-hosted by three MEPs: Andrey Kovatchev (EPP, Bulgaria), Karin Kadenbach (S&D, Austria) and Roberta Metsola (EPP, Malta). Around 70 people took part, with panellists and participants debating different approaches to empowerment – such as access to quality healthcare for all, health literacy and patient education. The highlight of the event was the official presentation of two campaign policy documents: the Charter on Patient Empowerment (Figure 3) and the Roadmap for Action. 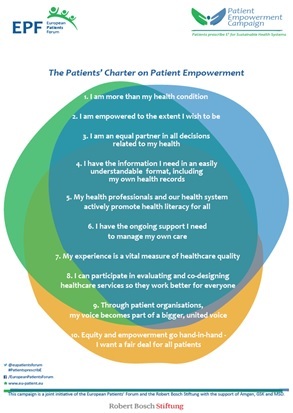 The Charter on Patient Empowerment was co-developed with EPF members and encapsulates the ‘cardinal rules’ of patient empowerment and outlines what really matters to them. It defines the fundamental principles of patient empowerment from the patients’ perspective. The document is intended to be ‘owned’ by patient communities across the EU, and supported by other stakeholders to ensure concrete commitment from all. It can be used as an advocacy and political tool to promote action and culture change ‘on the ground’, or at policy level. It is already available in several languages. The Roadmap for Action turns the Charter’s principles into eight priority actions (Figure 4). It is the result of the EMPATHIE study, which recommended the development of a European strategy on patient empowerment to inform policy, practice and further research. EPF sees this Roadmap as a tool to identify key areas to be included in such a strategy. The priority areas and actions in the Roadmap are highly complementary and identify multiple paths to achieve high-quality, patient-centred, participatory and sustainable European health systems. The Roadmap does not have specific timelines, as EPF is taking a long-term view. 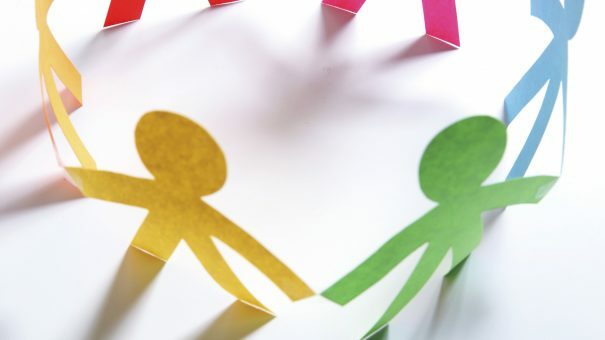 Nor does it specify who should take which action, as the engagement of a wide range of stakeholders – patients, policymakers, different health/social care professionals, and sometimes commercial actors – is required in each area. A new, more collaborative, mind-set is needed to break down existing silos and develop solutions together – always with patients and their representative organisations as partners. There are examples of good practice and innovation in many of the key areas identified, which EPF will continue to collect and share later. A full report and pictures of the closing event are available on EPF’s website. Patient empowerment is at the root of the European Patients’ Forum’s vision and mission. It represents 67 patients’ organisations and an estimated 150 million patients across the 28 EU Member States. The organisation promotes the collective involvement of patients at all levels of health policy to develop patient-centred health systems. Empowerment is embedded in its policy work, from information and health literacy to safety and quality of healthcare, through to patients’ meaningful participation in research, and in eHealth and mHealth. What will a no-deal Brexit mean for pharma and healthcare?